Water heaters often build up sediment that damages the tank. To remove these sediments, you may want to consider draining your tank. If you see metal or rust in your tank's water, call Classic Plumbing, Heating & Air Conditioning immediately. These particles probably indicate the anode rod needs to be replaced. The anode rod attracts chemicals in the water and keeps them from rusting away the tank liner. Caution: Turn off the power at your circuit breaker or shut off the gas before making any kind of water heater inspection. If the water heater liner corrodes, the unit can begin leaking. If the drain pan under the water heater is old or incorrectly installed, you may find your home experiences water damage to floors, ceilings or walls, depending on the water heater location. If you believe you have a water heater leak, call Classic Plumbing, Heating & Air Conditioning immediately. We offer 24/7 emergency service for water heater repair and replacement. Save energy and money by insulating your water heater. Unless your water heater's storage tank already has a high R-value of insulation (at least R-24), adding insulation to it can reduce standby heat losses by 25% - 45%. This will save you around 4% - 9% in water heating costs. If you don't know your water heater tank's R-value, touch it. A tank that's warm to the touch needs additional insulation. Insulating your storage water heater tank is fairly simple and inexpensive, and it will pay for itself in about a year. You can find pre-cut jackets or blankets available from around $10 - $20. Choose one with an insulating value of at least R-8. Some utilities sell them at low prices, offer rebates, and even install them at a low or no cost. You can probably install an insulating pre-cut jacket or blanket on your electric water heater tank yourself. Read and follow the directions carefully. Leave the thermostat access panel(s) uncovered. Don't set the thermostat above 130°F on electric water heater with an insulating jacket or blanket-the wiring may overheat. 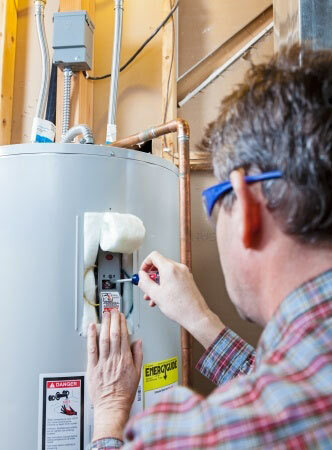 A service professional should conduct a thorough inspection of your water heater at least once a year. Our home plumbing experts will check the pressure relief valve, drain your tank to remove any sediment (if recommended), inspect the tank and connections for rust, wear or corrosion, replace worn anode rods, and more. Do you need a new water heater? Classic Plumbing, Heating & Air Conditioning provide water heater replacement services, including high-efficiency and tankless models.